Adult football will be played in Rye next season for the first time in two-and-a-half years. A new club, Rye Town FC, has been formed and will play its home matches at The Salts, which hasn’t been used for adult football since the demise of Rye United FC in 2014. Rye Town will line up in Division One of the Macron East Sussex Football League and will be one of 12 new teams in the league next season. Shane Ridgers and wife Charmaine have been very much the driving force behind the birth of Rye Town. Shane is manager and treasurer, and Charmaine is secretary, while Ged Say is chairman. Martin Blincow, Darren Paine, Francis Walker and Kevin Highams are on the committee, and Kelvin Wall is going to be assistant manager. “We’ve had a massively positive response from the people locally and players locally: all wishing it well and wanting it to work,” said Shane Ridgers. Rye Town will play in Rye United’s traditional red and black colours, while the change strip will be yellow and black. Sponsorship has been received from Rye Gardening Services (home kit), Rock Channel Marine (away kit), W. S. Wright (tracksuits) and Rye Hire Ltd (kit bags). 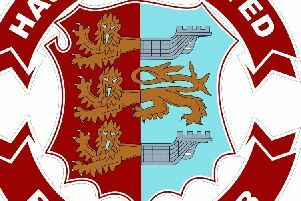 Training will start on Wednesday July 6 and several pre-season friendlies have been arranged, starting with an away game against Lydd Town on Saturday July 30. The emergence of Rye Town is a huge boost for football in the Rye area after Iden FC folded last year and Peasmarsh United withdrew from the East Sussex League at the conclusion of the 2015/16 season. “We just want to get football back on the map for Rye,” added Shane Ridgers. “With no local team any more, I thought it was the right time to get it going, although my wife has been doing everything to be honest.